How Heat From The Classic Gets To Your Home. The Classic can be located up to 500 feet away from the home or building being heated. Heated water from the Classic is pumped to the home or building through insulated, underground ThermoPEX piping - the most efficient way to move heat over distances. The Classic is designed to work with any existing heating system. A heat exchanger or direct circulation conveys the heat into a forced-air furnace, radiant baseboard, or radiant floor heating system. This gives you normal thermostatic temperature control. The Classic can provide heat for all your domestic hot water by adding a water-to-water heat exchanger. You can turn off your hot water heater and save $30 to $80 or more per month! 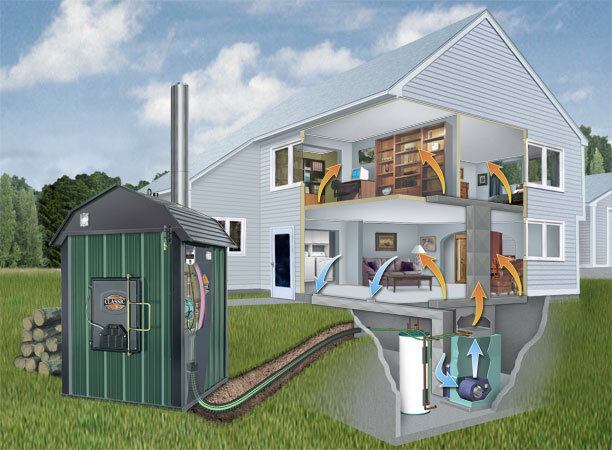 In addition to heating an entire home or building, the same Classic unit can also be used to heat other buildings such as a garage, workshop, shed, greenhouse or barn -- without using other heating sources. It can even be used to heat a swimming pool or hot tub. © 2019 ALL in One Outdoor Furnace, Inc.